Offering unmatched power quality and power management, the Powerware 9 Prestige is a modular UPS system is designed to accommodate virtually any mission-critical application for a few minutes or for several hours. The Powerware 9 Prestige UPS power supply delivers the best power protection for AS/400 servers, industrial applications, and internetworking devices such as ATM switches. The Prestige Series has been discontinued. For Prestige replacements up to 3000VA , we recommend the Eaton 9130. 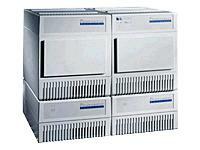 For Prestige replacements of 4500VA to 6000VA , we recommend the Eaton 9PX.